While my wife was away, I mostly got my lunch and dinner from a near by Uttara Karnataka mess that makes soft chapatis and delicious side dishes. However at times, I tried my hand with cooking. I love to cook pastas for lunch or dinner, as they are pretty easy to make. I also enjoy trying new recipes. This time, I tried making some healthy vegetarian soup. 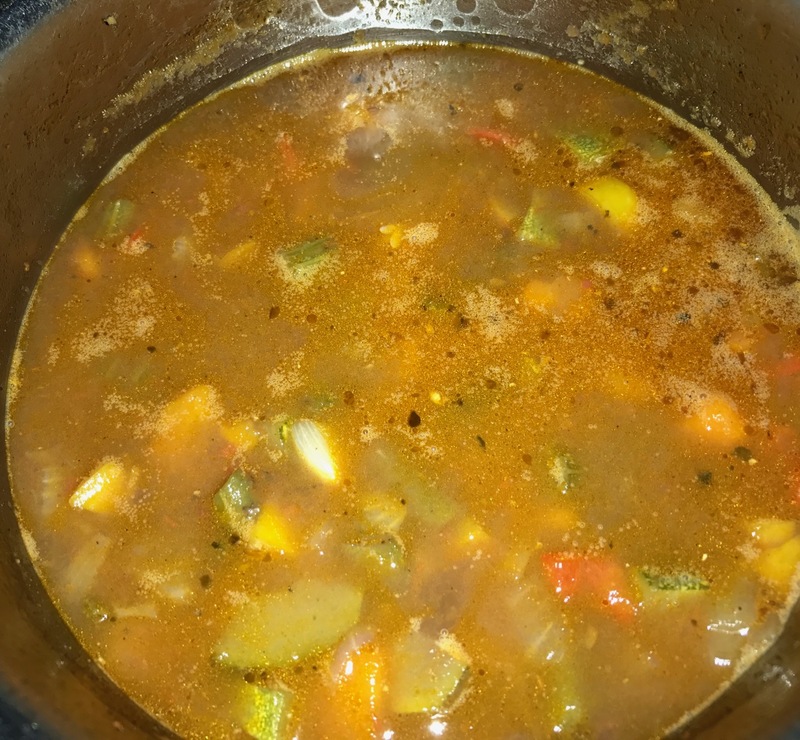 Addition of Celery and zucchini added great flavour and aroma to this soup. 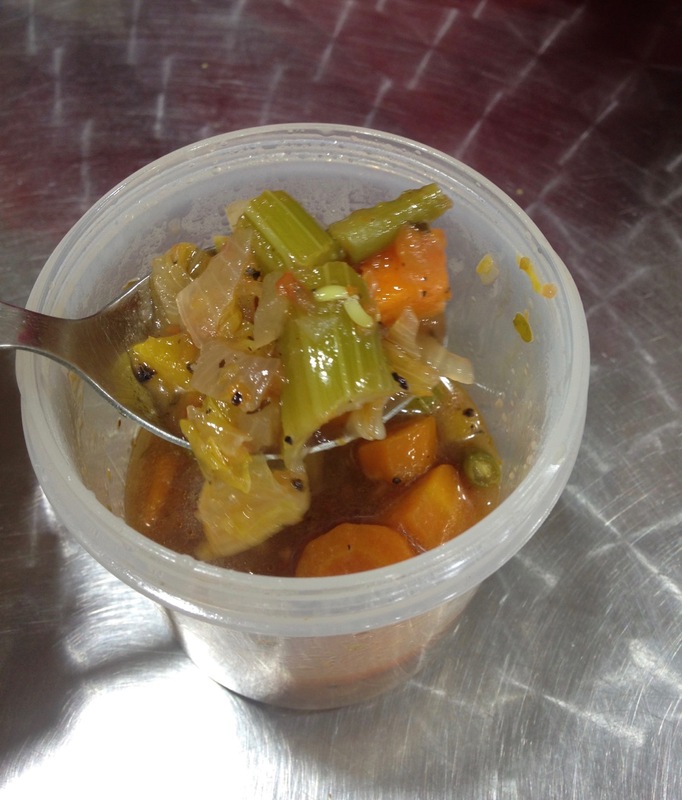 Ingredients - Onion, Celery, Zucchini, Carrot, Beans, Capsicum, Pepper powder, Tomato puree Oregano, Basil, salt. 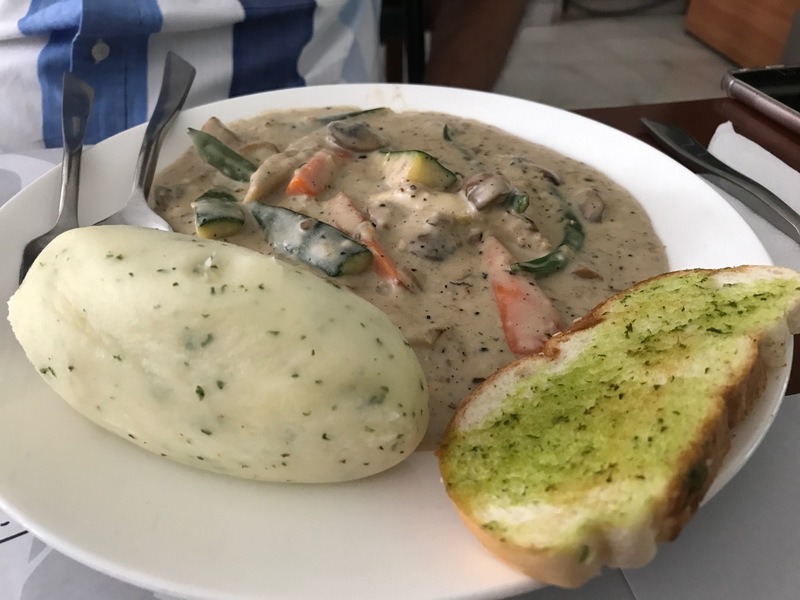 My colleague Prasad who, like me loves European cuisine suggested we try this restaurant called Bistro Oui at Koramangala. We had some great food there. The veg platter was delicious. I particularly liked the marinated and roasted paneer. 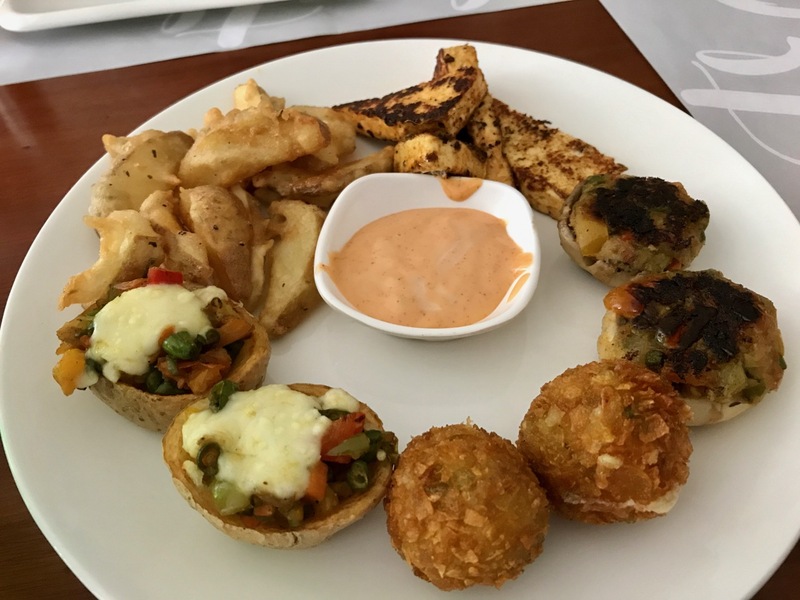 Though not a big fan of mushrooms, I loved the stuffed mushroom they served. Veg stroganoff was delicious and I love mashed potatoes. 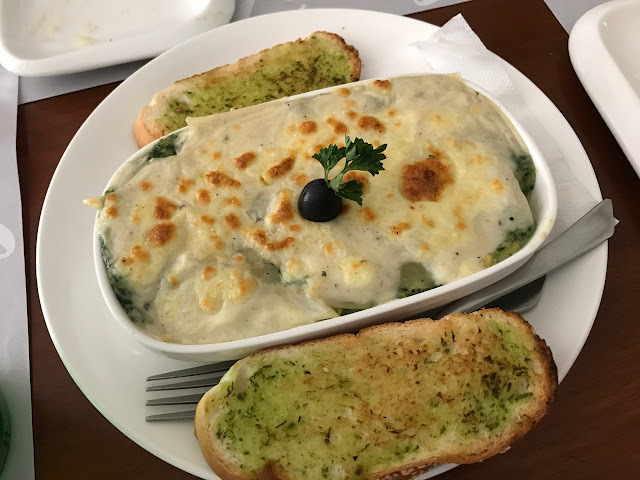 Corn and spinach lasagna was not appropriately baked but it tasted good. 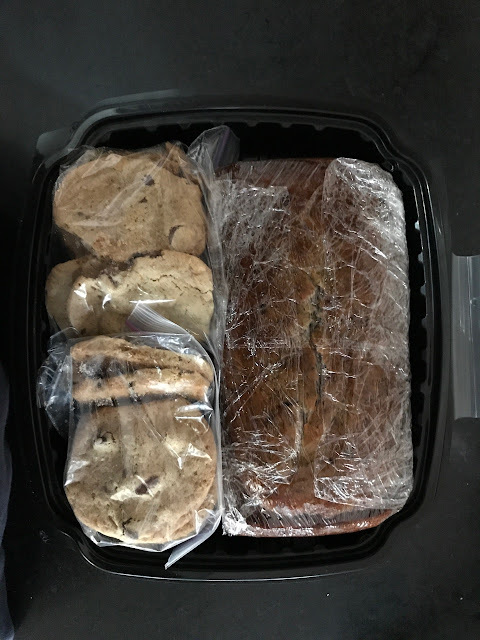 One of my nicest colleagues Chung Hee from the US sent me some cookies and Banana cake through a friend who was traveling. Chung Hee makes amazing cakes and biscuits and while I am in the US she always welcomes me with some great homemade desserts. I was delighted by this gift as the walnut Banana cake she prepares is our personal favourite. In India, we offer food to all. It is believed that an year on earth is equivalent to a day in heaven and the dead parents are offered food on their death anniversaries. All other ancestors are offered food just before Dasara on the day of Malaya Amavasya. I rarely travel to Mangalore for my grandmother’s death anniversary. I just do not like the grandeur with which it is celebrated. This time, my aunt who lives in bangalore asked me to join her as she makes a simple offering to her mother. 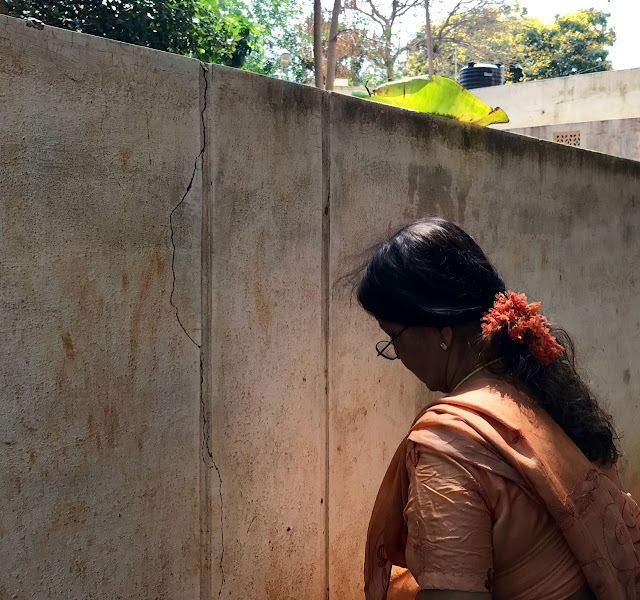 I spent a day chatting with my aunt and uncle, talking about all the common interests we share and of course remembering Ajji. On the contrary to the celebration at my house, this was very simple and that is what made it more meaningful. Wonderful post. Mouth watering photos. It is dinner time here. I am hungry now. It is my fate I have to cook now. Food is the universal glue - it can turn strangers friends and bind families together. I love the exchanges that occur when people share a meal. The rituals that surround death can be complex and for some, hollow. It sounds as if you have started a new, simpler and more meaningful way to honour your grandmother. Thats is very true. Food unites people. Hummmm !! Comment résister ?... Plus je vous lis et plus j'admire vos belles photos je sens que vous réveillez ma gourmandise !... J'aime tester de nouveaux mets. J'adore également cuisiner et concocter de nouvelles recettes en essayant de mêler les saveurs des produits. Gros bisous et merci pour votre gentil commentaire.